Víctor de Diego was born in Bilbao in 1964. He studied music at the Conservatorio de Música de Bilbao and at the Liceu de Barcelona, majoring in the saxophone. He attended several international seminars in Bilbao, Madrid and Barcelona with Bob Moses, Roy Haynes, Mulgrew Miller, Max Roach, John Abercrombie, and George Garzone, among others. His professional career began in 1984, when he played with groups such as Pork Pie Hat, Infussion and Quartet Creciente, winning several prizes at the San Sebastián, Getxo, Mallorca and Ibiza festivals, including best soloist at the Donostia Festival in 1986. In 1986 and 1987, he played with the Bilbao Symphony Orchestra under Enrique García Asensio, in 1992, 2003 and 2004 with the Orquesta de cambra del Teatre lliure de Barcelona under Josep Pons, with the Ballet contemporani de Barcelona in 1994, and with the Russian State Symphony Orchestra under Mstislav Rostropovich in 2001. Víctor de Diego also works as a studio musician and appears in TV shows such as “Jazz entre amigos”, “Jazz & Co.” and “Jazz a l’estudi” on several TV channels (TVE, TV2, TV3, ETB and Canal 33). He has worked with theatre companies and artists including Armando Manzanero, Olga Guillot, Moncho, Nina or Amaia, with whom he toured throughout Spain between 1986 and 1992. 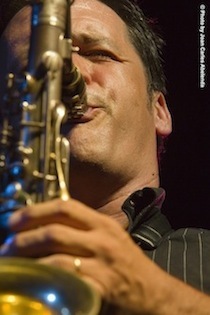 He has also performed with Jordi Bonell, Sean Levitt, Jimmy Owens, Jordi Rossy, Lluis Vidal, Javier Colina, Jerry González, Carles Benavent, Perico Sambeat, Idrish Muhammad, Jeff Ballard, Iñaki Salvador, Kevin Hayes, Al Foster, etc.